The help to buy scheme phase 2 extends the government loan guarantee to all home buyers (not just new builds for phase1), which simply leverages home buyers with just 5% deposits upto 20%. I.e. if you have a £25k deposit then as of Phase 2 (as far as the banks are concerned) you now have a £100k deposit as the government now guarantees the banks against losses on the additional £75k (15%). The effect of this is to greatly extend the amount of debt that banks are willing to lend and thus home buyers can afford higher priced homes. A £25k deposit at 80% LTV would only allow for a maximum mortgage loan of £125,000. As an example a couple on a combined income of £60k with a £25k deposit would only be able to borrow a maximum of £125k on an LTV of 80%, and thus afford to buy a property in the £150k price range. Now a £25k cash deposit at the same effective 80% LTV will allow a home buyer to borrow upto a maximum mortgage loan of £500,000 at an actual LTV of 95%! Which represents a huge potential expansion in borrowing capacity, subject to earnings. As an example a couple on a combined income of £60k with a £25k deposit would now be able to borrow a maximum of £210k on an LTV of 95% (effective 80% LTV), and thus now be able to buy a property in the £235k price range, some £85k higher than last week. 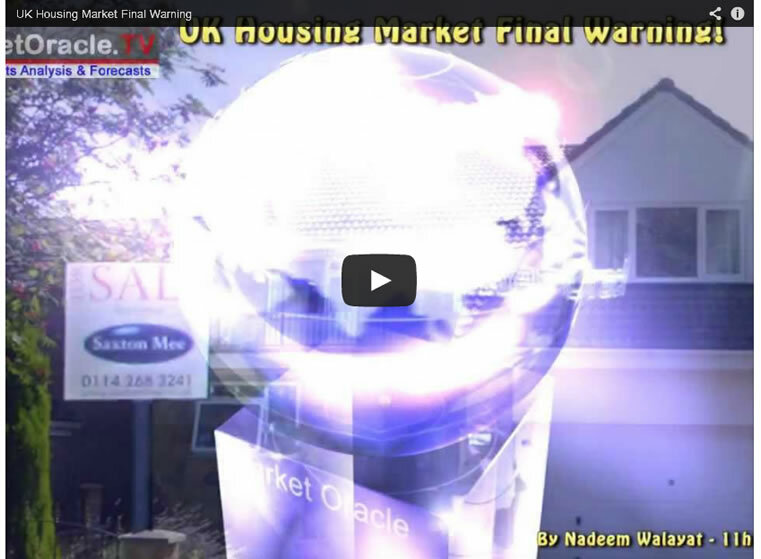 Will Help to Buy Phase 2 Create a Housing bubble? The coalition government politicians don't think so. But in reality off course it will because the DEMAND for mortgages could literally DOUBLE! The government has initially ear marked £12 billion towards the scheme which with an average guarantee of £40k would be enough to cover 300,000 Help to Buy mortgages, enough financing for about a years worth of expected demand. Thus huge extra demand and limited supply means soaring house prices as I warned before the start of Phase 1 in March 2013. 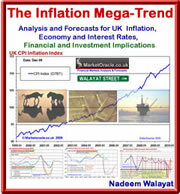 My most recent in-depth analysis of Mid August 2013 ( UK House Prices Bull Market Soaring Momentum, 10% Inflation by October? ) concluded in an expectation for UK House prices to be rising by more than 10% per annum on release of October 2013 data in November and by 12% per annum for January 2014 data, with further expectations for 10%+ price momentum to continue into at least mid 2014 as illustrated by the below graph. The effect of INFLATING house prices at a rate of AT LEAST 10% per annum WILL result in PANIC BUYING as people will FEAR waiting to buy, especially as from now on it is a case of OFFERS OVER ASKING PRICES for MANY and an expanding number of areas of the country that will likely see house prices being marked SHARPLY HIGHER over barely a few weeks ago in response to the increased footfall of prospective buyers as the house prices boom shockwave's continue to emanate out of the London epicentre in increasing waves of magnitude. Soon home owners will be seeing their house values rising at a monthly rate that is greater than their earnings and thus will be far more inclined to vote Conservative in gratitude for the increase in their paper wealth, despite the fact that it is NOT real wealth but just a means of creating MORE debt which my next in-depth analysis will explain at length - to get this analysis in your email in box, ensure you are subscribed to my ALWAYS FREE Newsletter.